CaribPR Wire, Brooklyn, NY. 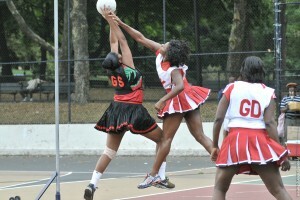 Tuesday, July 13, 2010: Four teams competing for the title of LIME/Caribbean American Netball Association champion 2010 moved closer to grabbing the trophy after topping their respective divisions last weekend. Volcanoes4 moved to the top in the Junior round while Pitons3 moved up to top the Intermediate round. 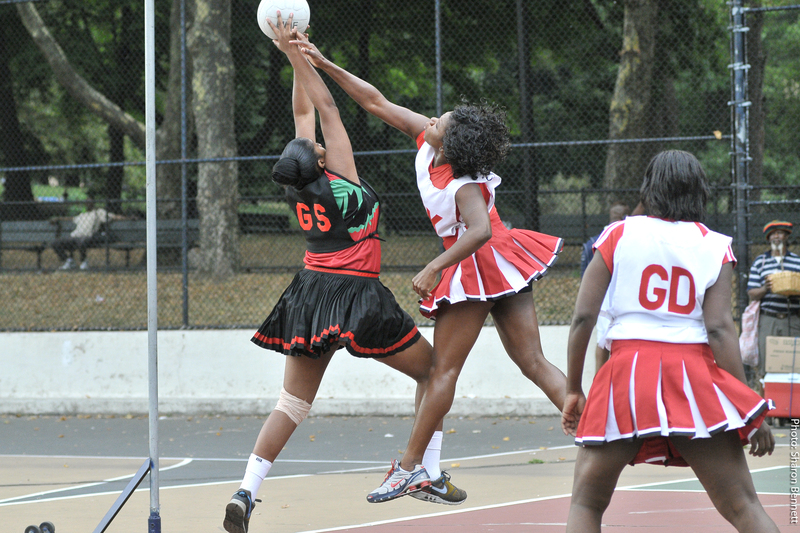 Upsetters2 and Crusaders1 moved atop the Seniors 2 and Seniors divisions at the end of last weekend’s eighth round of competition at the Lincoln Terrace Park courts at East New York and Buffalo Avenues in Brooklyn, New York. Both Saturday and Sunday featured a near full schedule of sixteen matches but it was Upsetters2 and Pitons3 who jumped ahead of the standings after scoring two wins each. With half of the schedule still outstanding, Pitons3 crushed the competition twice on the weekend to set off whispers about a promotion to the senior division next season. They separated themselves from Crusaders3 in every department, winning 39-15 on Saturday and returning on Sunday to put the exclamation on a badly outclassed Islanders2 team 37-18. Pitons3 share top billing at this stage with Senators2 – 15 points. Senators 2 remained unbeaten with a lopsided 42-28 win over Volcanoes Inc.
Crusaders1 moved to 17 points and the top spot in the ladies division, easily outscoring Pitons1, 40-26. Upsetters1 which has the same points total, did not play on the weekend. With Pitons2 dropping full points to Senators1, 31-27 for their first loss of the season on Saturday afternoon, former champions Upsetters paraded one of the best unit in the park, literally walking over a Spice Girls team that clearly did not come to play. The final score in the match was a woeful 45-13. It was a bad weekend for Pitons2 and one they will want to quickly forget. With a chance to at least share the division lead, they stumbled badly, dropping their second match inside 24 hours, failing miserably against the run and shoot, up tempo style of Upsetters2, 52-27. It was clear that they were still recovering from the bruising on Saturday, that had the two teams at each other’s throat and umpire Andre Edwin, hot under the collar. The pair of Captain Sharon Pierre and Sarah Marcelle did well to keep Pitons2 in the game up to the end of the third quarter, when a questionable call by umpire Edwin, forced a time-out. Senators played the final quarter under protest and almost lost their cool had it not been for the red hot shooting of Karen Charles on offence and Tanika Mercurius. Other results on the weekend were; Untouchables1/United1, 37-34; Volcanoes3/Typhoon1, 25-31; Sunsplash2/Typhoon2, 38-22; Volcanoes4/Sharecroppers, 32-16; Antillian1/United1, 36-38; Untouchables1/Spice Girls, 40-19; Crusaders2/Sunsplash1, 33-29. The tournament continues with 14 matches this weekend – July 17th and 18th, respectively. Start time for each match is 4 p.m.
A Volcanoes teammate left, erupts for one of her team’s 25 points but that would not be enough as rivals Typhoon (center) blew by for a winning 31-25 score-line in LIME/CANA tournament (senior2 division) action at Lincoln Terrace Park, Brooklyn on Saturday, July 10, 2010.